The Boston Red Sox are back at Fenway Park this season! There are many different ways to save on Boston Red Sox Tickets, game day parking, and more to make a game a little manageable for the wallet! *This post contains some affiliate links for some ticket sites mentioned and I receive a small percentage if you make a purchase through my link. Thank you. Red Sox tickets directly through the Red Sox ticketing website start at $10 and go up to $189 for face-value tickets for non-premium seats. Ticket fees are additional with a $7 processing fee on your total order and a few dollar fee per ticket as well. Ticket prices for the Boston Red Sox work on a tier-pricing system with 5 different pricing options available with tier 1 being the most expensive and tier 5 being the least expensive. Basically, low demand games (like a weeknight game in April) will be lower than high demand games (like a weekend game in the summer). Cold month games, weekday games, undesirable opponents, standing room only tickets, and seats in the bleachers and grandstands will be the cheaper options. Tier 5 games start at $10 and you can check out the Fenway Park Seating and Pricing guide for the complete breakdown of the tier-pricing system to find the perfect section for you based on preference and budget. If you would like to have an idea of your view from different areas of Fenway Park, you can place your seats in the Red Sox seating chart to give you an idea of the seats. Keep in mind that Fenway Park is the oldest baseball stadium in America so there are seats with obstructed views and not directly facing the field; however, when you purchase tickets on RedSox.com there should be a little red asterisk warning you of the obstructed view before you purchase. Tickets can be bought the day of the game, but only a limited amount of tickets are for sale beginning 90 minutes before game time at Gate E ticket window. You can wait in line up to 5 hours in advance for tickets, but you do need to proceed into the stadium once you receive your ticket. This is not a guarantee way to buy tickets, and you do not know what seats are still available, if any. For more information for game day tickets through the Red Sox, please head here. Also, ticket scalping is illegal in Massachusetts. However, there is a scalp-free zone at Gate C 90 minutes before game time and Red Sox personnel are on hand to monitor ticket sales between fans, if you’d rather go that route for tickets. If you are visiting Fenway Park from out-of-state and have visited other ballparks, you may have showed up at the gate and got tickets right there at a decent price. I know I’ve done this for other major league baseball teams in the past, but the Boston Red Sox are a little different. You will run into a huge line and definitely a different experience from other ballparks. It’s recommended to buy tickets ahead of time if you want a guarantee way to catch the game. Check the Red Sox Ticketing website for tickets and availability first as well as other sources. Student9s: Students can register to receive special student ticket offers at Fenway Park like tickets for $9 with valid ID! Members of Red Sox Kid Nation: Kids 14 and under can sign up for Red Sox Kid Nation and receive a free ticket to a Red Sox game this season! Military Members: Special pricing on Red Sox tickets for active military and veterans available on a first-come, first-serve basis. Promotional Games: Bobblehead nights and other giveaway nights happ throughout the season for particular games with freebies. Follow on the Red Sox on Social Media: Follow the Boston Red Sox on Facebook and Twitter to find special promotions and offers such as no ticket fees for tickets. Monster Seats: Monster seats can also be bought directly through the Red Sox ticketing website; however, you need to go to this page to purchase tickets. Monster seats are on-demand pricing, so you can sit in the exact seats for two different games and pay wildly different prices. Sometimes buying Red Sox tickets directly through the Red Sox may not be the best option, especially if there’s none available. Also, sometimes if there’s a lot of availability directly through the Red Sox, third-party sellers may be selling tickets cheaper than face value! Keep an eye out on third-party websites for upcoming poor weather games or last minute seats, since you may be able to get a great deal! SeatGeek is a great website to check out after the Red Sox ticketing website because it is a ticket aggregator (think Kayak.com but for tickets). It lists the price of tickets from multiple ticket agencies all on one page. This is a great way to see what the market is doing and what to expect to pay without going to a million different websites. Keep in mind that SeatGeek is a ticket aggregator and may refer you to another site so you may want to do a quick google search on the ticket company it refers you to if you’ve never heard of the company before. However, there are a lot of reputable companies on the list– just be careful if there’s a new site on the list with little information, with really low prices. You can always check out individual third-party ticket resellers directly if you’d rather like StubHub if you want to buy your tickets through a notable and reputable third-party agency. Craigslist is another popular option for sox tickets, especially for cheap and/or last minute tickets. You can get some deals and great seats at the last minute, especially. However, you are more likely to be scammed through Craigslist than other sources, so just be careful if you do go that route. If you are looking for the safest ticketing option, besides directly through the source, Red Sox Replay is the next best thing. Red Sox Replay is the Official Red Sox Ticket Resale Marketplace where ticket owners can post their tickets for purchase by other fans. If you can’t find tickets for the game you want directly through the Red Sox ticketing site, this is a nice safe option as it’s backed by the Red Sox. There are a lot of different third-party sources and options. You can definitely over pay for tickets if you don’t do your research, but you can also score some great deals on tickets if you do. 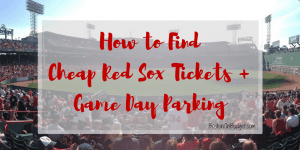 Game Day parking is a tricky subject because who wants to tell you where to park and then not be able to park in their favorite lot because everyone has read this blog and now the author can’t find a cheap spot. Tragic right? First off, I will say that I encourage you not to park really close to Fenway Park because it’s really expensive (and crazy busy). I will also encourage you to take the MBTA (or walk!) if those are options for you (ESPECIALLY for weekday afternoon games because parking garages will be full of commuters and extra pricey). Take the B, C or D Green Line to Kenmore (any except the E Line) and follow the signs to Fenway Park. If you are taking the commuter rail in from Metro West, the Framingham/Worcester Line stops at Yawkey Station. Commuter rail prices vary depending on location and distance. The T is $2.25 a ride with the Charlie Card or $2.75 with a Charlie paper Ticket. The Official parking lots of the Boston Red Sox are 100 Clarendon Street and the Prudential Center garage. Personally, I think the Clarendon Garage is a little too far (1.3 mile walk) but it’s only $10 to park for evening and weekend games with your ticket stub. The garage at the Prudential Center is $18 with your ticket stub and is only .7 miles away to Fenway Park, depending on the entrance you park near. The Boston Red Sox website has a very helpful page dedicated to parking near Fenway Park and they break down the parking garages by price and location. However, there are a lot of other options not listed as well, so don’t feel overwhelmed. 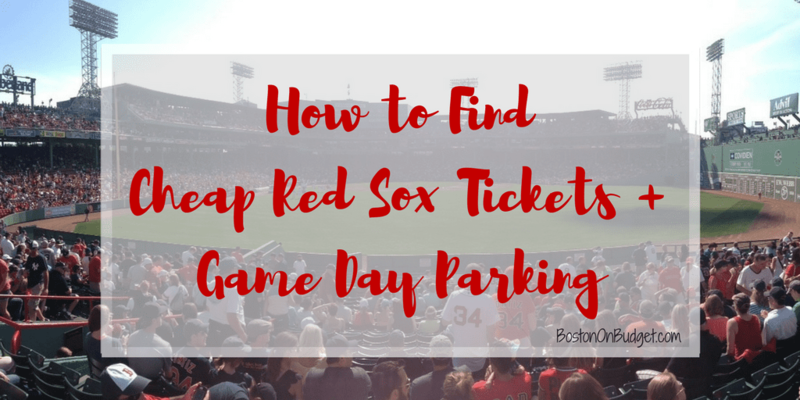 Luckily, there’s technology and smartphone apps which make parking at Fenway Park a little bit easier. You can see how much parking is at each garage without driving around to every garage. You can even reserve a parking spot beforehand. Amazing, right? I personally only use SpotHero because I have a level of comfort (and free parking credit) with them and hate to try new things, but there’s other options too. I included my referral link to a few different options so you and I both get free credit when you use them for the first time. Parking near Fenway Park can be busy and really expensive. The closer you are, the more expensive it is. Lots also fill up so it’s smart to park further way to Fenway Park and/or reserve a parking spot in advance. If a Red Sox game is too expensive or are not playing when you’d like to see the ballpark, you can always take a Fenway Park tour or grab a beer a Bleacher Bar as an alternative. There’s so many different ways to save at Fenway Park. The best technique really depends on how much flexibility (and budget) you have. Do you have any tips for saving at Red Sox games this year? *This post does contain affiliate links. Please read my disclosure policy here. Nice tips, thank you. Go SOXX!